SteveAndBelle had the most liked content! 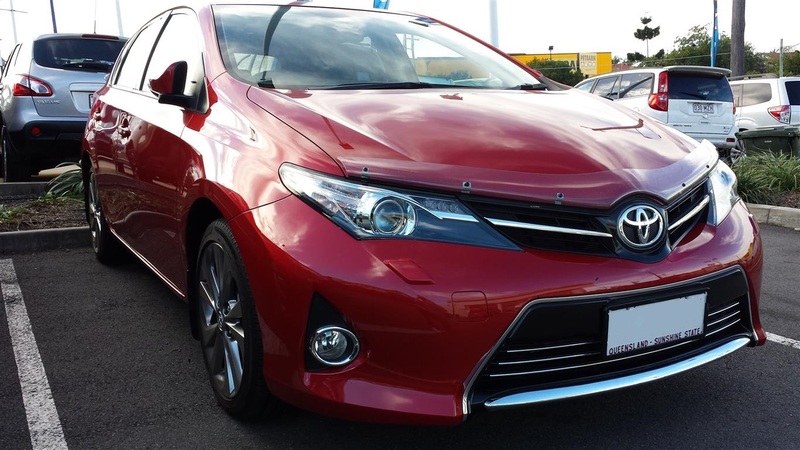 DAB+ into a 2013 Corolla ZRE182R? The harness arrived on Friday so I decided to begin the install today... even though the good antennas still a couple of weeks away. I soldered up the Red, White & Yellow AV cable supplied with the Digital Tuner directly to the pins on the harness and grounded the AV detection pin but no matter what I did I couldn't get it working as it was before. Over an hour later I decided to disconnect all plugs from the head unit then reconnect them 20 seconds later just to give it a decent reset. Bingo, the AV input worked again so it must've shut itself down while I was playing around with it. Connected the Digital Tuner and was watching crystal clear Digital TV and listening to DAB+ soon after. I then dealt with the handbrake sensor and speed sensor and took the car for a spin. Apart from the so-so reception from the tiny magnetic antenna supplied with the Tuner it worked perfectly so once the amplifier stick-on antenna arrives it should be as close to perfect as it can be. I've put it all back to stock (a 5 second job thanks to the harness) while I wait for the antenna to arrive but I've attached a couple of shots of the harness and a shot of the head unit displaying Channel 7 News just to show it working . Any questions please feel free to ask. UPDATE: my Xtrons 'Car Digital TV Receiver' (http://go.redirectingat.com/?id=2061X573376&site=au.toyotaownersclub.com&xs=1&isjs=1&url=http%3A%2F%2Fwww.ebay.com.au%2Fitm%2FCar-Mobile-Free-View-DVB-T-Digital-TV-Receiver-Box-MPEG-2-Antenna-USB-SD-Slot-%2F121121942924%3Fpt%3DLH_DefaultDomain_15%26hash%3Ditem1c336e2d8c&xguid=3470d32adc6bc90dc2716c509181582e&xuuid=fd5d86ee53f809af1a4c1752787899fa&xsessid=dfb67205264bd98c753e6ab224e39d6a&xcreo=0&xed=0&sref=http%3A%2F%2Fau.toyotaownersclub.com%2Fforums%2Ftopic%2F51465-dab-into-a-2013-corolla-zre182r%2F&pref=http%3A%2F%2Fau.toyotaownersclub.com%2Fforums%2Findex.php%3Fapp%3Dcore%26module%3Dglobal%26section%3Dlogin&xtz=-600) arrived yesterday. 10 days from China, not too shabby! I ripped it out of its box, connected it to a TV and had a play. Seems to work quite well when on the test bench however I know the supplied magnetic antenna isn't going to hold up receiving DAB+ signals while moving so I've ordered a couple of these stick-on amplified antennas to experiment with: http://www.ebay.com.au/itm/351422658564?_trksid=p2057872.m2749.l2649&ssPageName=STRK%3AMEBIDX%3AIT Still waiting for the harness (pictured above) to arrive before I get back into pulling the dash apart but so far all seems to be looking good. 2. Yes, the Reverse Camera should simply connect to the Reverse light circuit for power as there's no need to run it constantly... however some people like to have them powered up all the time and add a small switch so they can activate it at any time for whatever reason. Some people even add a front facing camera into the mix so they can switch between them but that's getting off topic. Once you've mounted it and have fed it power all you then need to do is run the signal cable up one side then connect it into the head unit. Easy but time consuming. 3. Tuck the camera somewhere discreet up near the boot release button/handle but try to find a place where you'll be drilling/screwing it into plastic and not metal. Not a big problem if you have to drill into metal but best to hit the holes & screws with some paint or rust prevention stuff from the inside once done... just to be on the safe side. Keep in mind that if you'll then need to pull the wiring through the rubber boot of the boot lid to wire it up to the reverse lights and feed it through the rest of the car. 4. Fuse everything and always put fuses as close to the power source as possible for best protection against catastrophic failures and silly mistakes. You may want to look at buying a nice power distribution fuse block from Jaycar or wherever as installing one now will save you a lot of hassle later on if you decide to install more Amps or whatever. Even something as simple as this: http://www.jaycar.com.au/Sight-%26-Sound-Car/Car-Audio-Hardware/Car-Hardware-Accessories/Two-Way-Gold-Fused-Power-Distribution-Block/p/SZ2070 allowing a nice thick but as-shot-as-possible 4GA feed direct from the positive terminal on the battery through two fuses then out to two thinner 8GA feeds to run to the Amp and/or active Sub. Remember, keep the fuses as close to the battery as possible!! Circuit breakers are also available however they usually only start at around 50A which may be a lot higher than the gear you're trying to protect therefore rendering them useless if something does go wrong. The thick 4GA feed should only need to be 20-50cm long as you should be able ot find a nice position to mount the fuse/distribution block somewhere nearby in the engine bay. Find an existing cable run through the firewall and simply pierce the rubber boot and run the cable through but be aware this can be a painful exercise as the cables usually have a rubbery coating and you may need to lube the cable up so it doesn't grip as you pull it through. Oh... and obviously only connect the Power Cable to the battery once everything else has already been connected or without the fuses installed. It doesn't take long for a short piece of thick cable to melt and start a serious fire if shorted out to earth! Amp, Speaker & Sub selection is totally up to you but don't discount a decent under-seat Sub as some of them can be pretty decent! Here's a review I did on a few about 5 years ago: It does all depend on how much you've got to spend versus your expectations. I'm an old duck now and although I used to build my own large Subs powered by crazy high current Amps etc. I'm way past all that these days and find the stock systems 'good enough'. I also don't drive anywhere near as much as I used to so it's pointless blowing loads of cash on something I'm not going to get a lot of use out of. That money now gets funnelled into mortgages & home Hifi instead ;) Hope this helps and please feel free to ask more questions. Hi Cosmicr and welcome to the forum. BIG post... but first up, the head unit upgrade & harness. Why not just buy a full Toyota-to-Pioneer harness with Steering Wheel adaptor built in? Something like this: http://www.ebay.com.au/itm/CTSTY001-2-TOYOTA-COROLLA-2001-2011-STEERING-WHEEL-STALK-CONTROL-INTERACE-LEAD-/381298277086?pt=LH_DefaultDomain_3&var=&hash=item58c725fade I put a Pioneer DAB+ Double-DIN unit in my ZRE152R a couple of years ago and the adaptor worked perfectly and without any soldering! I'm a true geek and back-in-the-day I used to install ALL my head units by chopping off the connectors and soldering everything but this way the head unit swap itself took less than 5 minutes (seriously!) and sounded perfect. It then took another few minutes to install the mic and another 20-30 minutes to install the DAB+ antenna. Hopefully this adaptor harness answers your first question at least. Steve. Ha, went to Northfield Nundah today and asked if they had either a genuine Toyota 28-pin plug or just the pins to insert into one or just something else suitable I could use the pins from. No problem about paying for any of it, I just thought they of all people would have something suitable. I was presented with a blank faced member of staff who asked what I was trying to do. I explained and was told "nah, that isn't possible". I thought he may have misunderstood so I explained it again but even before I finished he said "nah, impossible" so I told him I had it working last night, thanked him and walked out. Wow, they really know what they're talking about (not). All good. I'll probably just try to get an original loom plug from a wrecked car and remove the pins from that or buy a male-female harness adaptor such as the one attached. The harness adaptor cable would be ideal as I could leave the original loom completely untouched and do all my silly mods (inc. handbrake & speed sensor bypass) to the adaptor instead. This would allow me to take everything back to original untouched perfection within a matter of seconds if required. They're about $50 though, blerg. Success! Managed to get a video signal to appear when AV is selected using pins 13 & 14 of the 28-pin connector. It was only up there briefly as I'm literally just stuffing wires down into the connector but it did work nevertheless which was enough to prove the concept. I will go get a connector from a wrecker or off another harness so I can solder up some proper pins and retest this soon. Looks like the AV input is a go-er for stereo Audio and Video. Next thing to experiment with is the Handbrake & Speed sensor cut-outs and hope there isn't also a GPS based speed sensor cut-out too. If there is a GPS cut-out then that will kill all hope of getting this to work nicely. Hi all. About to take delivery of a very lightly used 2013 ZRE182R to replace my old ZRE152 that was written off a few days ago. Gotta say the '182 is leaps and bounds better than the old '152 so I think I'm going to really like it :) The '182 has the factory double-din NAV Head Unit and from the brief play I've had it looks to be pretty decent however I really want DAB+ in this car as I bought a decent Pioneer unit for the previous car and now can't go back to FM ;) Short of replacing the whole Head Unit with the non-NAV Pioneer I pulled out of the old car or blowing $1000+ on a new Pioneer with NAV and DAB+, is there any way of nicely feeding a DAB+ signal into the original? I've had a look at the pinout diagram of the rear connections and it doesn't look as though there's an easy way of injecting a simple Left/Right stereo feed but in saying that I'm now actually sure which model head unit I have so maybe it is possible?! Any help would be appreciated. Oh yeah, I know! Basically all insurers lead back to AAMI or Suncorp. Budget Direct are underwritten by Auto & General Insurance Limited plus there are a few others who are independent of the AAMI/Suncorp beast so we've gone with them instead because now we know a 100% not-at-fault claim will end up like this with a 'Premium' insurer then we may as well save some cash and just go with a smaller insurer and expect the same service. Can't get a lot worse! Yep, the assessor needs to be sacked and never re-employed in a customer service role as he was beyond hopeless (feel free to PM me for his name!) however the fact that a magical fairy decided to add the note to our claim about us not wanting to go ahead with the repairs is really where it all began. That gobbled up over 3 weeks alone!